Such great work. Unfortunately for those of you who want one, it’s a one of one. However, it’s currently being auctioned off on ebay, with 25% of the final sale price being donated to the MARSOC Foundation. Just remember it only fits the G19/G23 compact model Glocks. Those of you might remember PHLster from the Star Wars Yoda Kydex Holster I posted a while back. 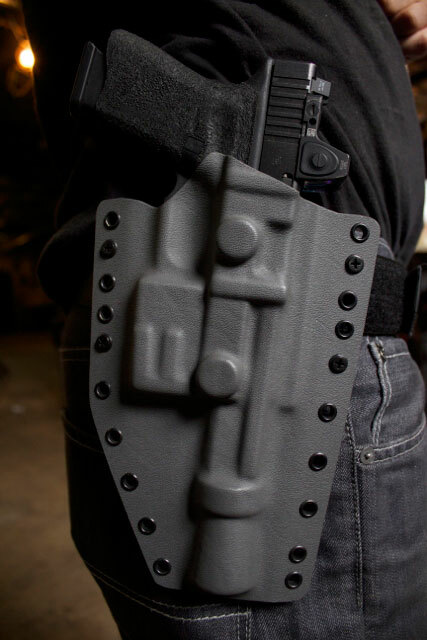 Now that I see this… the possibilities for troll kydex holsters are endless. I’m thinking next up a Glock blunderbuss holster! Oo! So, I can shoot first!? It could be easy to make one for a toy blaster, assuming it was made well enough to withstand the Kydex forming without crushing or deforming. I don’t think a $10 blaster toy would survive. On top of that, modifications would have to be made to allow all of the irregular shapes to pass through the holster, thus eliminating the distinctive and recognizable blaster shapes. In order for this to be a functioning Glock holster, I had to sculpt each piece to fit a Glock19 an assemble it around the gun. It was not easy. It was, in fact, quite time consuming. However, this allowed me to keep the definition of the distinctive blaster shapes, since they’re just empty space inside the holster. Only the slab-sided Glock needs to pass in and out, not the cone shaped muzzle device or all the other irregular blocky shapes of the blaster. i just assumed the top blaster shaped molding was an extra layer over a regular holster. I just watched a video last week where Adam from Mythbusters made an almost-exact replica of the New Hope Han blaster from a bunch of parts. It was really awesome to see what people have figured out went into the build of that gun. This IS the holster you are looking for.